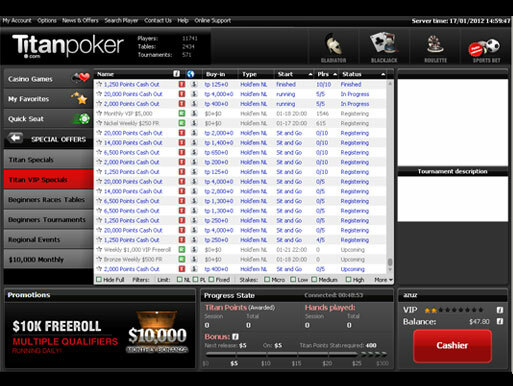 Established in 2005, Titan Poker is currently the #1 online poker room on our site. With great bonuses and promotions, a tight schedule of fantastic tournaments and stakes ranging from micro-limits up to high roller action, it's no wonder Titan Poker has achieved such success. 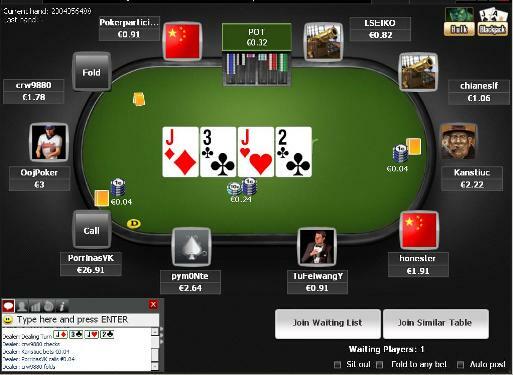 A part of the iPoker Network, this online poker room provides unsurpassed customer service and security measures with plenty of convenient payment options available to their members. 200% up to $2000/£1300/€1400 Bonus Cash- Must Use Bonus Code IP500FREE! Make your first deposit at Titan Poker and you would normally receive a 50% deposit bonus up to $200. We have negotiated a special deal for our readers of 200% up to $2000/£1300/€1400 and after you deposit. Earn Player Points at ring games and tournaments to automatically release the bonus in increments of $5 for every 600 Points accumulated. Players have 3 months to release as much of the bonus as they can. New Titan Poker players are also offered a very unique bonus of a chance to win a brand new Plasma Television, valued at $1,500. When a new player makes their first deposit, they are issued a Titan Tournament Token. The player has 3 months to use the token to enter any one of the weekly Plasma TV Freeroll Tournaments, each awarding two Plasma TV packages. The token is only good for one entry. Dont forget to use this titan poker bonus code IP500FREE. The loyalty rewards at Titan Poker are presented in a 6-level VIP program; Bronze, Silver, Gold, Titanium, Platinum and Diamond. Players rise through the ranks by collecting Titan Poker Points on raked ring games and tournament fees. All new players start at Bronze. Average 2,000 points per calendar month to achieve Silver, scaling on up to Diamond for 60,000 points per month. Higher VIP levels grant faster accumulation of points, personal VIP service, entry to special weekly and monthly freeroll tournaments, heightened reload bonus percentages and loyalty cash rewards. Diamond VIP members are awarded special tournament entries with a shot at the WSOP, while top Diamond players are automatically awarded WSOP seats. Points are collected at a rate of 18 points for every $1 in tournament fees (fees only, not buy-ins). Ring games award points for each raked hand in the following manner: 1 point for every $.25-$.50 rake, 2 points for $.51-$1 rake, 4 points for every $$1.01-$1.50 rake, 6 points for every $1.51-$2 rake, 7 points for every $2.01-$2.50 rake, 9 points for every rake of $2.51+. Another bonus code which is great is this Party bonus code from TightPoker.com which reviews the top bonus codes online. If promotions are important to you, Titan Poker Coupon Code is not to be missed. Players are offered a complete list of regular promotions, offering everything from huge jackpot prizes and $2,500,000 guaranteed tournaments to sleek sports cars and entry to the largest poker circuit events in the world. The top twenty Titan Poker Point collectors will get a chance at their share of $1-million in the Tournament Titan - guaranteeing $1,000,000 with only 20 players entered! Refer your friends to Titan Poker for a free $75 bonus, plus $25 bonus to your friend. Titan Poker has ensured their players the easiest deposit and withdraw capabilities by supplying an extensive list of optional payment methods. Accepted currencies include USD, Euro and Pounds. It should be stated however that Titan Poker does not accept US players at this time. Payment methods accepted: Visa, MasterCard, NETeller, PaySafeCard, FirePay, Click2Pay, Ukash, EntroPay, MoneyBookers, InstaDebit, myCitadel, EcoCard, UseMyBank, WebMoney, ClickandBuy, Local Bank Payment, Wire Transfer and Bank Draft.